A few months ago I discovered a Sleek make-up counter in my local shopping centre's Superdrug. Excited since I'd always wanted to try Sleek and wasn't sure about ordering it online, I went and had a little nose at the brand and ended up buying my first Sleek i-Divine Eye Shadow Palette in Vintage Romance. If you've seen my Winter Favourites that I posed yesterday, you can see this has made it to the list! But to find out more about the palette and what I think scroll down and read on. As you can see, the Vintage Romance palette consists of 12 beautiful colours in pink/purples, blues, darks and metallics; Vintage related colours which remind me of tapestries and florals. 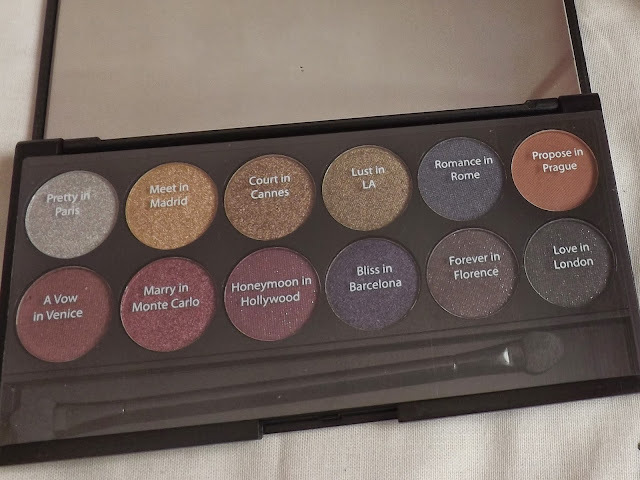 The 12 colours also play on the romance part of the palette's name, each having playful name using 'romantic' settings in the capitals of the world. All these things drew me to buy this palette and the colours work perfectly for dark and playful autumnal looks. The entire palette is highly pigmented, from the silver to the purples and the black, all applying with such rich colour. I also love the diversity in the palette with some colours being quite heavy and shimmery, some being flat and matte. My favourite colours to date are definitely between, Meet in Madrid, Marry in Monte Carlo and Bliss in Barcelona. I think it's probably because they're the most strong and vivid in colour, as well as being a shimmering colour. Although I love the entire palette as a whole I do have my least favourite colour, and I am often confused as to why it's there in the first place. Unfortunately it is Propose in Prague, and I guess it's most probably because I don't suit dark nudes, and for this reason am not sure how to use them in a look. Overall, I've really enjoyed using this palette and creating so many make up looks like the one below; From dramatic dark eyes to shimmering romantic looks, all using this palette alone! I'd definitely recommend it if you were thinking about buying it. Or if not....! You could enter my current blog giveaway where I'm giving away this palette along with a few other beauty bits! Just click on the link to get directed to the post! I really want to get another one to add to my blossoming collection. Have you got a Sleek i-Divine palette? Which one would you recommend? Lovely palette, are they exclusively at Superdrug? Honeymoon in Hollywood and Bliss in Barcelona caught my eye (excuse the pun! ), beautiful warm colours for this time of year!